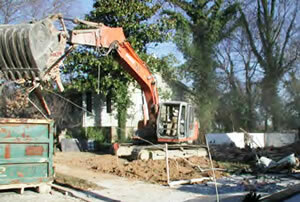 A2Z was contracted by G. L. Schnader to demolish a residential house in Baltimore. 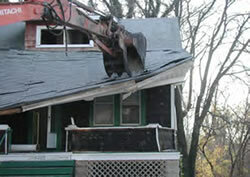 The customer was responsible for the demolition permit and to have all utilities cut and capped before mobilization. Miss Utility clearly marked utilities on the ground, making location and removal ex-pedient. The excavator was delivered to the work site on a lowboy trailer by an A2Z driver. After checking that all utilities were cut and capped and noting where the under-ground lines ran, demolition began. Be-cause of the close proximity to other houses, the work area was kept neat and dust free. A worker stationed at a safe distance used a water hose to keep the dust cre-ated by the demolition manageable. Our demo operator started crunching the mid-dle of the house with the excavator in order to make the house collapse into the basement. The debris must be reduced in size to facilitate disposal. Using the bucket with a grapple, the debris was chewed con-stantly to reduce its size. Doing this also keeps the area of the demolition compact. The last of the debris is loaded in a 30 yd. This demolition required several 30 yard containers for debris. The debris was taken to a local landfill for disposal. When the house was reduced to the foun-dation, the entire area was cleaned to separate the masonry foundation from the wood debris. The foundation was broken up and disposed of at a local concrete recycler.